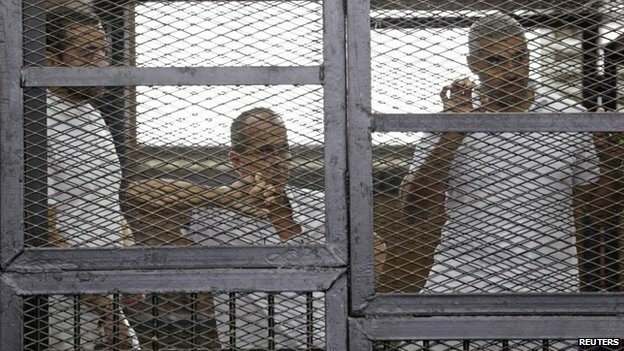 On June 23, Al Jazeera journalists Peter Greste and Mohamad Fahmy were sentenced by an Egyptian court to seven years in prison; their colleague, Baher Mohamad, to ten. Greste, an Australian citizen, was charged with “collaborating with terrorists”, Fahmy and Mohamad with membership in the Muslim Brotherhood, a now outlawed group. All had been detained since December 29, 2013, when they were arrested in Al Jazeera’s makeshift office in a Cairo hotel. The sentence has prompted international outrage and condemnation. Not least because of the farcical nature of the trial, in which Greste’s holiday photos and footage of a news conference in Kenya were used as evidence against the trio. But also because these journalists, unlike so many of the 211 journalists currently jailed worldwide in their home countries, belong to a foreign media organization. By targeting foreign media workers, and anyone who associates with them, the Egyptian authorities are not only demonstrating their willingness to antagonize key international foreign aid donors, but also creating an atmosphere of fear and intimidation that will ensure extreme self-censorship amongst its own journalists; working with international media will no longer afford local journalists and civil society groups any degree of protection, instead it could lead to harsher sentences. The sentencing and incarceration of the three journalists represents the latest case in a growing global trend: an increasing number of journalists silenced or imprisoned under anti-state and counterterrorism laws. According to a 2012 report by Human Rights Watch, while 50 countries already had counterterrorism laws in place on September 11, 2001, more than 140 governments have revised or enacted counterterrorism laws since then. By the end of 2013, more than half of all incarcerated journalists worldwide were being held on anti-state charges. Much of the legislation used to prosecute them is overly vague and broad, easily tailored to apply to any voice of dissent among a country’s citizenry. It is dissent that the Egyptian Government is trying so hard to suppress, with national and regional consequences. The regional implications of the case are bound up in a decades-long struggle between secular and Islamist factions that has played out in Egypt since the first half of the 20th century; a struggle that reverberates around the region. While the reality of daily life is more nuanced than this simple dichotomy suggests—as Maurice Chammah explained in his September 2013 article for The Revealer, “On Piety: Egypt, Islam, and the Muslim Brotherhood”—politically, the tension between secular and Islamist interests manifest themselves in Egypt’s secular military rule and the Muslim Brotherhood. Founded in 1928, the Muslim Brotherhood is the oldest Islamist movement, inspiring affiliates and branches throughout the world, according to Mohamad Bazzi, Associate Professor at NYU and former Middle East Bureau Chief for Newsday. While initially focused on religious outreach, they joined the struggle against British colonial powers and were briefly allied with Gamal Abdel Nasser and his Free Officers Movement, who overthrew the British in 1952. But when a member of the movement attempted to assassinate Nasser in 1954, thousands of members of the Brotherhood were arrested, jailed and tortured, marking the start of a decades long strife that continued through the Sadat and Mubarak regimes. The election of Mohamed Morsi in 2012 marked the start of a new, but short-lived, era of political engagement and leadership for the Brotherhood. Given the country’s history, Egyptian President Abdel Fattah el-Sisi’s demonization of the Muslim Brotherhood is not new. Nor is the repression he’s meting out to civil society organizations and human rights lawyers, as well as the press. But there had been great hopes for change in the wake of the 2011 uprising. That freedom was short-lived, and Egyptian press and civil society is now dealing with a government apparently bent on eliminating the Brotherhood from Egyptian life. There had been great hopes for change in the wake of the 2011 uprising. In addition, the journalists are at the center of a regional power play, pitting Saudi Arabia against its smaller but increasingly influential rival, Qatar, Al Jazeera’s home base and benefactor. During Nasser’s crackdown on the brotherhood in the 1960’s, many of its members fled to Saudi Arabia, where they found refuge and slowly began to establish themselves within the country’s institutions, as teachers and professors. Fearing their influence, the House of Saud began to see them as a threat. While Egypt benefits from Saudi Arabia’s fear of an Egyptian Islamist government—in July 2013, Saudi Arabia offered Egypt a $12 billion rescue package—western donors are left with very little leverage to influence the sentencing of the journalists and Egypt is free to act with relative impunity. “There is very little that can be done right now until political violence and political divisions subside, and we don’t see that happening in the near future,” says Mansour. “Unfortunately, we are coming up to the anniversary of the ousting President Morsi and also the killing of thousands of his demonstrators on August 14, and this is going to be an opportunity for opposition to mobilize. There will also be a lot of political tension, so the international community has very little opportunity for engagement under this kind of atmosphere. However, despite the continued promise of aid from the United States just the day before sentencing took place, and Saudi largesse, a massive budget deficit means the Egyptian government is not in a position to dismiss international opinion entirely. “Right now President el-Sisi is running the highest deficit in Egypt’s history, more than $30 billion in the annual budget and that’s three times all the aid that was promised from Gulf countries, including Saudi Arabia,” says Mansour. Egypt needs foreign investment, and the political money offered by the Gulf States isn’t going to encourage the reforms that are needed to attract those investments. “Only money from international donors, including the U.S., E.U. and the World Bank gives credibility to recipient governments because it comes with those reforms embedded in it,” Mansour said. In this case, press freedom and the fate of the three journalists are nested not only inside the question of political freedom but also in an ever-widening geopolitical gyre of regional and international power and influence. Let’s hope that some of that influence will be brought to bear to secure the freedom of the journalists and the students incarcerated alongside them. You can read Part One in this series, “Religion and Press Freedom in the Digital Age – Part One: Information on Trial” here. Natasja Sheriff is an freelance journalist based in New York. From 2012-2014 she was the Luce Foundation Fellow at the Center for Religion and Media and served as The Revealer’s international editor. Natasja co-organized the Information on Trial event with members of Amnesty International Local Group AI280.